Santiago Is An Ideal City For Cycling. For This Reason, La Bicicleta Verde Offers Bike Rentals Almost Every Single Day Of The Year La Mejor Forma De Conocer Santiago Es Pedaleando Por Sus Calles, Ciclovías Y Parques. Santiago Is An Ideal City For Cycling. 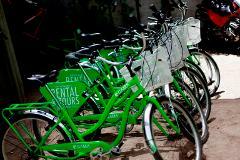 For This Reason, La Bicicleta Verde Offers Bike Rentals Almost Every Single Day Of The Year. La Mejor Forma De Conocer Santiago Es Pedaleando Por Sus Calles, Ciclovías Y Parques.